If you've seen some of my recent posts you now that we have had some irratic weather lately. It occurred to me that many of you might not know what our "normal" winter weather is like here. I will be doing a short series during the next week that I hope will give you a taste of winter here in the Deep South. You might be surprised. All photos featured have been taken during the last week in December. Today, a stroll through the Birmingham Botanical Gardens. Sometimes when I take my daily walk on Jemison Trail in Mountain Brook, I drag my camera along, especially if it's a sunny day. Shades Creek runs along the trail and I spotted these lovely stones at the water's edge, shimmering in the morning sun. Doesn't get much prettier than this. *Merci Peter, for helping me finally figure out how to enlarge my photographs. Your handy diagram did the trick!!! * I'm scooting under the deadline for Two Things this week which is my M.O. Actually I had these before I knew what the challenge was so it all worked out. I'll start with the FAUX (FAKE). This is a portion of a lovely metal piece that is mounted on an arbor near the rose garden at the Birmingham Botanical Gardens. I took this Saturday on our one gloriously warm, sunny day. The REAL is this beautiful yellow rose that I shot last fall in the rose garden. I hope it brightens this cold wintery day that most of you are having. THE TUNE DU JOUR IS "AIN'T NOTHING LIKE THE REAL THING"
Even the shrubs and the bees think it's spring! Fast forward FOUR days. The temp yesterday was .......73F !!! No ice, no coats, not even a jacket! Rumor has it some of my friends even turned the AC on. I will admit it made for a gloriously sunny, breezy day for a long walk or just sitting outside and getting some much needed fresh air after weeks of rain, drizzle and gray skies. Got cabin fever? Come on down to Birmingham. You're welcome here. I'll leave the light on. The Tune du Jour is "Blue Skies" as only Willie Nelson can sing it. The Tune du Jour is..... well just see for yourself!!!! Condensation. It's that simple really. The Tune du Jour is " The Way We Were". Well 4 out of 5's not bad. This is as good as it got! Today is Christmas Eve. A time of waiting and expectation. Heard the news today??? It snowed in Birmingham!!! Well in one yard anyway. I must be the luckiest blogger in the world. I am driving through my neighborhood this morning and low and behold there's a veritable blizzard blowing through this yard!!! Screeech. Pulled over, grabbed the camera and snapped away. A very enterprising neighbor had rigged up his homemade snow machine again this year. Since the temps have hovered in the 60-70'sF for weeks, no go on the snow. But aaahhh, today was a nice frosty morning, just perfect for snow making foolishness. The top photo is his side yard in the process of becoming a Birmingham phenomenon. Late this afternoon, I passed and a neighbor's grandchildren were sledding, and I was recruited to photograph. Oh, twist my arm !!! I risked life and a limb trying to capture their fun as they plummeted down his very steep hill on sleds into bales of pinestraw at the bottom! Ho Ho Arrives at Triangle Park!
" Look, do see Rudolph up there in the sky?" It happens faithfully the Sunday before Christmas. Residents and friends gather in Forest Park's Triangle Park to enjoy hot cider and donut holes and await the magical sound of .... not sleigh bells... but the sound of the sfire truck's siren. THAT'S how Santa arrives! There are squeals of excitement and delight and Santa climbs out throwing fistfuls of candy to the awaiting crowd. This is usually followed by the wails of some frantic toddlers when they realize Santa is actually going to mingle with the crowd. That is to be expected. There is always a rousing version of "Rudolph the Red Nosed Reindeer" and "Santa Claus is Coming to Town" sung by Santa and his adoring throng. Santa works the crowd and listens to every wish. An added attraction is the fire truck and the wonderfully patient fire fighters that serve as Santa's helpers. Many thanks to the Clairmont Avenue Fire Dept. for making this such a wonderful neighborhood event each year. I am departing from my usual one or two photos today because, well I had so many cute ones I couldn't choose and there are only a few days left to cram these in. HO HO HO!
" Santa I'm down here"
" Hey, that dog looks like me!" true love's paintjob!! Only a select few bloggers know that I have had a ongoing love affair with this fine red truck for a long time. (Well let's just say he'll do till the "real thing" happens along.) I must ride past him parked down in my neighbor's driveway a dozen times a day. FINALLY, yesterday they moved him to the street where I could photograph from every angle without being charged for trespassing. Eat your hearts out Snapper and Dusty Lens! And Wayne, it's not a tractor but it's close! Just pin a big scarlet "T" on my chest. And no, I have no idea what make or model. Love is blind. The Tune du Jour is " Crazy" by Patsy Cline - hey it fits! Bogue's restaurant has been a Birmingham institution since 1938! Unbelievably, I remember sitting at the counter as a little girl drinking the coffee cream from little glass bottles! Located on Clairmont Avenue in Birmingham's Lakeview neighborhood they are still open for breakfast and lunch. Vintage radios adorn the shelves adding to the atmosphere along with old black and white photos on the walls. It is like stepping back in time. The Tune du Jour is "It Was a Very Good Year"
Just for the record, this is NOT one of my grandchildren, but to be honest she is a neighbor. I only intended to post the gingerbread decorating party once, and then when I downloaded the photos....ahhh! Try as I might, I could not resist this portrait of Scout with the afternoon sun giving her a little "halo". Licking the icing off her finger sealed the deal. Call me weak. 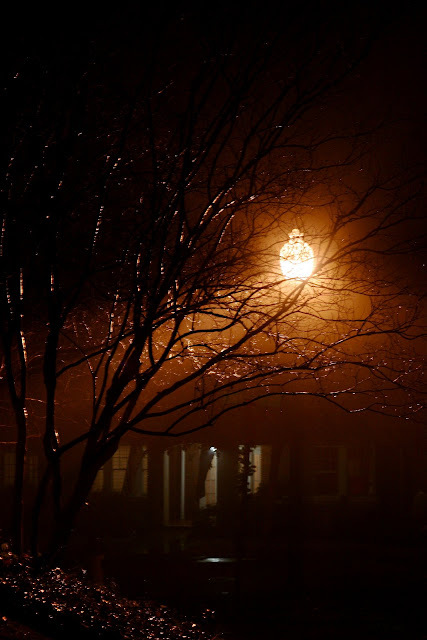 Today, guest blogger Peter is sharing some of his night photos! The Tune du Jour is "Entre le boeuf"
Discover Les Petits Chanteurs Du Thymerais! One of the perks of hosting Birmingham Alabama Daily Photo is that it gets you into the most interesting places! I have volunteered some of my time to the wonderful Birmingham Children's Theatre. You read about it earlier here. What an asset to our city and state, but sadly this theatre company is feeling the economic pinch along with many non profit groups. Please see the website if you feel that you can offer some financial assistance to this most deserving organization. They have asked me to take some photos for them and I couldn't be happier. I dabbled in the theatre just a tiny bit in high school as a props and stage manager. Getting free reign to wander around backstage and see what's going on in the scene shop has been great fun. Today's offering is from their wonderful production of "The Best Christmas Pageant Ever". It was my all time favorite book to read to my class when I taught third grade. Now I get to see it on stage and it is outstanding! As I have shared with you previously I participate in a reading tutoring program at my church. Today was the annual Christmas Party. First, Mrs. Robinson read the Christmas story (below) which we all enjoyed. Shortly after that, Santa Claus himself burst into the room and led us all in a few Christmas songs while he accompanied us on his GUITAR! Next, he passed out books from each child's two weekly tutors and a stocking bursting with surprises. Shortly before the gift opening began one little girl shyly said, "Santa, I have letter for you." Santa urged her to go get it. She returned with the letter and a grocery sack tied tightly. When he unwrapped it he found this teddy bear. Finally, Santa gets a gift! Merry Christmas, Santa! PS There wasn't a dry eye in the place! Coming on Friday - Guest blogger Peter, Peter's Paris, will share some of his photos ! The Tune du Jour is " Whatcha Gonna Call Your Pretty Little Baby"
Discover Marvin Chandler , The Jack Gilfoy Quartet! For the last 20 or so years, a dear group of friends has gathered before Christmas at the home of Johnny and Ginny Wood. Now that all of our kids are grown, the circle has widened to include the grandchildren, whose numbers are increasing at an alarmingly delightful rate! The Wood's player piano is a huge draw. Sometimes we sing along and everyone has turn on the bench with Johnny pretending to play. Sunday night was another special evening celebrating the season and just enjoying being together. I caught Johnny and our Davis in the living room "playing" a special duet. Since I have this fascination for photographing hands, I couldn't let the moment pass. This photograph touches my heart in many ways. What is more fun than making your very own gingerbread house??? There's all that wonderful sticky icing to be licked off your fingers, and a plethora of candy to be stuck anywhere you want to put it. When Mom's not watching, you can try and cram as much of that candy in your mouth as possible. Today, two candy crammers hard at work! Joyeux Noël! Today is Mid Month Theme: Subway Day for some of my blogger friends. Since Birmingham has no rapid transit system, I asked if I could join this prestigious group should I get a good Metro photo in Paris! My friend Peter accepted my offer and slyly passed his "spot" off to me this month. My photo can be seen on his great blog, Peter's Paris. Thank you Peter, for letting mine sit amongst your wonderful Paris photos!!! Henry took candy placement very seriously! The Tune du Jour is " Here Comes Santa Claus" by Elvis! This star ( or a similar one) has hung in this very spot at the top of the hill in the suburb of Homewood since I was a girl. For me it signals the Christmas season. I hope they didn't crank it up there before Thanksgiving this year. I forgot to check. Regardless, it's always nice when our traditional holiday memories don't get replaced with newer, glitzier ones don't you think? Thanks Homewood, for preserving a special memory. Those of us lucky enough to live in Alabama during the winter months ( we are not going into summer weather!) are spoiled rotten. We can't relate to snow shovels, snow blowers, snow tires or any other nonsense pertaining to gobs and gobs of snow for 4-5 months of the year. Oh every so often we have temps that dip into the 20's but by the next week, you could be taking your walk in just a sweatshirt. Last night rumor had it we would have the dreaded "WINTER ADVISORY". Ohhhhh, will the schools close? Will we be stranded with no bread or milk??? What ever will we do? This morning I actually ran to the window and threw up the sash praying for some snow to help ease my photographic deficit. Ahhhh, false alarm, nada! I saw some frost on a few leaves but that pretty much wrapped it up. So for those of you in the hinterlands blowing, shoveling, slipping , sliding and busting....well you know, my prayers are with you . I lived through an Iowa and a Wisconsin winter. As we say down here, "Bless your hearts." Some of you out there may get a sleigh ride before it's all over! I don't know what you did on Wednesday night but I'll just bet I had more fun. A group that I belong to had dinner at Birmingham's The Club. Great friends, great food, great view of the entire city of Birmingham and GREAT entertainment! Meet Just Singin'. This fine looking group from Vestavia Hills High School, is an award winning jazz/doo-wap choral group. Under the direction of Megan Rudolph, they sang in amazing harmony and with so much spirit and personality that they received a standing ovation. They kindly let me photograph them after their performance. They apologized for "Uncle John" being scantily attired. Apparently his trousers were lost in route! They did their best to make him "presentable"!! Take a bow kids, you are off to great places as Dr. Seuss would say. This is the lampost on the corner of my street. Tonight I was in a hurry to get home, but it was raining and foggy and well I actually drove by, stopped and turned the car around to take this photo. D.C. Confidential and I had a really nice, long conversation on the phone tonight. She asked me if I thought I saw things differently now that I was more focused on photography. Oh my yes! Tonight was a prime example. As I have mentioned before, light, shadows, well everything catches your "eye" and most of the time, you cannot walk away from it. She commented that she now sees potential photos everywhere she looks as well. So do you, as a photographer, see things with a "different" eye now??? 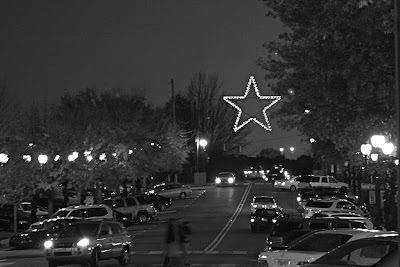 Mountain Brook Village is one of the most festive spots around during the holidays. All of the trees are lined with white lights (below) and they have a spectacular tree that is covered in colored lights. 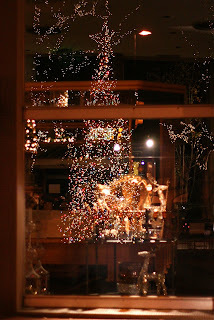 I caught this reflection in Bromberg's Jewelry store window. Lots of pricey baubles inside for shoppers that aren't feeling the pinch this season! The Tune du Jour is "It's Beginning to Look a Lot Like Christmas" by Perry Como of course! Here in Birmingham, it's time to get those perky pansies in the ground. What a visual treat they are set against winter's drab backdrop. I am always fascinated that this delicate plant stubbornly survives freezing temperatures and last year, even a quick snow. I took these photos in October with the morning dew still clinging to their petals. Actually, this nice Santa was the star of Brunch with Santa at Birmingham's Summit Club on Sunday. A very kid friendly event enjoyed by all. The Tune du Jour is "Santa Baby" of course! Allow me just one more foggy day photo. I would love to paint this but that might require dealing with my artistic frustrations, so I will just enjoy sharing this image with you. We don't have many foggy days around here, or maybe I just never noticed until I started seriously looking at my world with a photographer's eye. Could be. * My friend Blognote, Arona Every Day, what an inspiration and a mentor you have been. I hope this photo today comes close, in some small way, to your exquisite photographic style. "Breath of Heaven" by Amy Grant. Times are hard everywhere right now , and Birmingham is no exception. Every time I turn on the news, I hear that the homeless shelters are experiencing record numbers. This week even here in the deep south we have had freezing temperatures. I wonder and worry about my friends that I have met at the church breakfasts. I think today is the perfect day to introduce you to a very special Birminghamian, fondly known as Brother Bryan. He is one of our hometown heroes. The pastor of the Third Presbyterian Church , he is best known for being an outspoken supporter for civil rights and racial reconciliation and his selfless service to the poor in Birmingham. Maybe I should mention that this was in the early 1900's! It is said that often he arrived at home at night without his coat because he had given it to a needy stranger during the day. This tribute to Brother Bryan can be found in the Five Points South district. It has been moved several times and I personally regret that it now rests next to an outdoor seating area for a local cafe. I think Brother Bryan's statue by artist George Bridges, deserves a more dignified resting place. On the other hand, it is in close proximity to an area where many of our city's homeless can be found. Perhaps it's the perfect place for Brother Bryan. This holiday season when you are out purchasing gifts, please remember those that for whatever reason need a hot meal and a place to rest their head. Brother Bryan set a wonderful example for each of us. Ever wonder why Ebeneezer Scrooge was such a grouch? Putting up the Christmas tree!! Every year for as long as I have been single, Christmas Tree Day has found me muttering "Bah Humbug" and many other expletives under my breath. Today was Bah Humbug Day. In an effort to make this special day of the year a little less stressful for myself, I bought a new, slimmer, PRELIT tree. Once I hauled the 100 pound box up my basement stairs, fluffed each and every branch, put it all together, figured out the light situation, the rest was a piece of cake. The tree is up , twinkling , decorated and I am feeling that rosy glow of Christmas coming over me. ( That could be the wine, I'm not sure.) Anyway, today is December 5th and my tree is ready to go. I will deck the rest of the halls this weekend. I proudly present the end result! Noel Arrive as they say in Paris! Well if this doesn't take you "seasoned" viewers down Memory Lane nothing will. While I never had a spiffy model like this one that folds up, I still remember my first "hi fi" that played LP's. Jay Gilbert, I can hear you hyperventilating over this one!! I think I had this maddening habit of swinging that top arm back so that my favorite records would play over, and over, and over. I am sure that drove my sweet mother up the wall! If you want this one for your very own, give Jim Reed at Reed Books, Museum of Fond Memories a call. It's yours for the right price. Oh, and if you need a some fabulous old LP's, give me a ring. I'll work with you on that deal.